400 years after Dutch explorers first set eyes on Hoboken Cove, a team of Dutch architects and engineers have a hand in planning Hoboken, New Jersey’s future. It may be serendipitous that 400 years after Dutch explorers first set eyes on Hoboken Cove, a team of Dutch architects and engineers have a hand in planning Hoboken, New Jersey’s future. The efforts to develop the city’s response to climate change and rising sea levels in the wake of Hurricane Sandy are seeing input from the Dutch design firm OMA -- as part of the HUD-sponsored Rebuild By Design competition (more on this later). 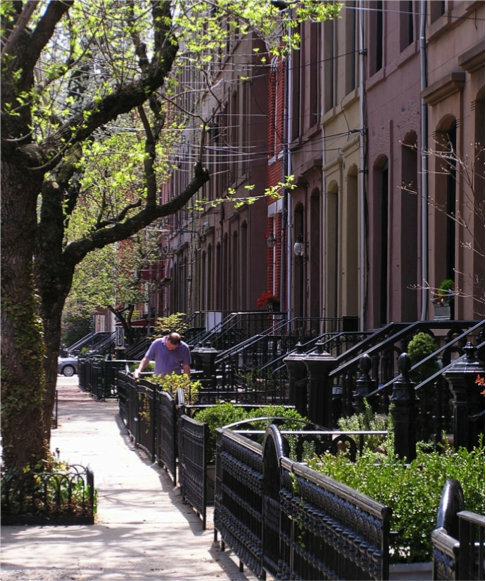 A brownstone lined street in Hoboken. Photo by James “JR” Ronczy. Hoboken is a compact blue-collar city of 50,000 people. It is characterized by blocks of brownstones and riverfront high-rises, packed into just under 1.75 square miles directly across the Hudson River from Manhattan. Unlike rural and suburban coastal areas, Hoboken's urban density presents a different set of challenges and strategies. Like the string of communities that form the west bank of the Hudson River, Hoboken is, in essence, a thin strip of land wedged between a river and a tidal marshland. More than two-thirds of the city's land area -- home to 53% of its residents -- is less than five feet above mean sea level. With limited pervious surface area upstream and an aging combined sewer system, flooding in Hoboken from periodic storm events is already a common experience. But this will significantly worsen as sea levels are projected to approach the five foot mark by the end of the century, leading to growing exposure to storm surges, exacerbated by upstream rain events. On October 29, 2012, when Hurricane Sandy crossed the New Jersey shore at high tide, Hoboken was presented with a preview to its future. The 14-foot storm surge breached the riverbank through the Long Slip Canal to the south and Weehawken Cove to the north, immersing emergency generators and flood pumps. The storm surge entered Hoboken from the south at Long Slip Canal (arrow on the left) and from the north at Weehawken Cove (arrow on the right). Courtesy Stephen Marks, City of Hoboken. With 500 million gallons of floodwater and pumps disabled, the city’s combined sanitary storm sewers backed up, filling over half the city with a toxic brew, and knocking out electrical power to over 90% of its residents for days. 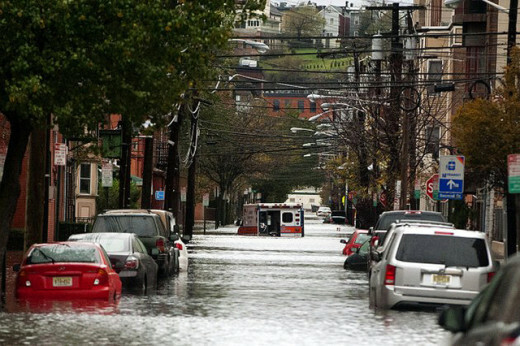 Much of Hoboken was flooded from storm surges caused by Hurricane Sandy. Photo by accarrino; Flickr Creative Commons license. 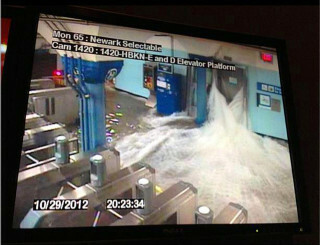 Security Camera in the Hoboken PATH Station; Nov. 12, 2012. The elevator entrance to the PATH station basically became a sink drain for the Hudson River to empty into the train tunnels. Photo and caption by accarrino; Flickr Creative Commons license. In addition to property damage estimated at $100 million, enormous business losses, and another $100 million in damages to the PATH transit system, the storm exposed the city’s vulnerability to rising sea levels. For Hoboken residents, over half of whom rely on public transit, the loss of PATH trains to Manhattan for three months was especially challenging. Hurricane Sandy was a shock to Hoboken. In response, the City’s planners moved quickly to prepare a Resiliency and Readiness Plan. Increasing capacity to handle recurring heavy rainfall and periodic storm surge events through the addition and elevation of three large pumps. Funding approaches include FEMA grants directly and through the North Hudson Sewerage Authority, low interest loans, or linking a pump to transit redevelopment plans at the south end of the city. Providing storm surge protection by building flood barriers along the north and south waterfront areas while introducing passive floodgates 1 at vulnerable perimeter streets and sidewalks, to be funded through FEMA Hazard Mitigation grants. Incorporating flood-resistant construction through urban design standards for private development. Developing energy resiliency by teaming with Sandia National Laboratories and the New Jersey Board of Public Utilities to implement microgrid technologies 2 with funding through FEMA Hazard Mitigation Grants. Strengthening emergency preparedness through both public outreach and awareness. Working with FEMA and New Jersey Department of Environmental Protection to revise city zoning and building codes to align building standards more closely with storm surge concerns in future development. Developing green infrastructure and improving stormwater management through the acquisition of property for parks, open space, and stormwater retention, and beginning work on rain-garden curb-extension 3 demonstration projects. Additional planning initiatives have included updates to Hoboken’s Comprehensive Plan to better address stormwater management, utilities, and infrastructure. Storm surge protection concepts mapped out on flood hazard map. From Hoboken Resiliency Plan. Courtesy Mayor Dawn Zimmer. 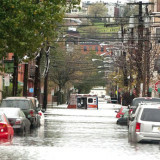 In addition to Hoboken’s own planning efforts, the City has participated in the novel Rebuild by Design competition -- a competition that is leading to creative long-term strategies for a number of cities in the New York City metropolitan area facing the threat of storms and rising sea levels. Organized by the U.S. Department of Housing & Urban Development in the fall of 2013 as part of the Hurricane Sandy Rebuilding Task Force, Rebuild by Design is supported by, among others, The Rockefeller Foundation and the Regional Plan Association. 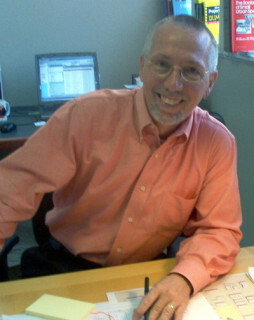 Henk Ovink, Senior Advisor to HUD Secretary Shaun Donovan, has led the program. Rebuild By Design is not setting out to solve a regional problem with a single solution. Ten design teams were selected from over 148 international applicants in a unique multi-stage format that invited the selected teams to collaboratively research over 40 potential project sites and proposals. The 40 possible projects were then narrowed down to ten. In the next phase, HUD paired each of the ten teams with one of the ten projects -- one of which focused on Hoboken -- to develop concept plans, drawing on input from experts, government officials, and the public). All ten concepts were exhibited in April. The video below includes an overview of Rebuild by Design by HUD Secretary Donovan (scroll the video to start with Secretary Donovan's presentation at 11:00 minutes into the video; Henk Ovink's remarks follow Donovan's at 22:10 minutes). HUD announced the selection of the six winning proposals earlier this month. They include Hoboken's entry, "Resist, Delay, Store, Discharge." 6 The City was paired with a team led by OMA, a Dutch design firm with New York offices, working with Royal HaskoningDHV, Balmori Associates, and HR&A Advisors. As Stephen Marks, Assistant Business Administrator for the City of Hoboken, told me, the Rebuild By Design proposal represents a unique collaborative effort fully supported by the City. 7 Residents and city staff worked with the OMA design team in multiple public meetings and work sessions. Develop hard infrastructure and soft landscape for coastal defense. Provide urban design features to slow rainwater runoff. Use green infrastructure approaches to store and direct excess rainwater. Install secure water pumps and create alternative floodwater drainage routes. 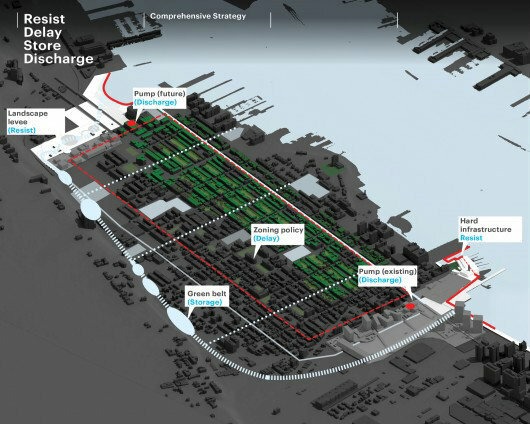 Resist, Delay, Store, Discharge: the theme of the winning Rebuild by Design proposal for Hoboken. The plan proposes to create a landscaped flood barrier and hardening of the waterfront to protect the city from inundation. At Weehawken Cove to the north, a park landscape will serve as a defensive wall, protecting Hoboken, Weehawken, and critical regional utilities from storm surge. Wetlands will provide a natural filter, mitigating potential sewer overflow. Within the city of Hoboken, green infrastructure -- increased open space, permeable paving and the previously mentioned rain gardens -- will slow the flow of water and reduce flash flooding. Short video on winning proposal for Hoboken: Resist, Delay, Store, Discharge. Note: there is no sound with the video, but you'll still get a good overview. Additional Rebuild by Design videos are available on the Vimeo web site (most with narration. Along Hoboken’s south and west edges, around the transit lines, rainwater storage as part of a “green infrastructure will also create a visually attractive community asset. Additional pumps will also be installed and incorporated into new development along the waterfront. As far as implementation of the plan, Mayor Dawn Zimmer has stated, “There is no timeline yet,” but hopes the riverside park and levee system can be completed in the next several years. 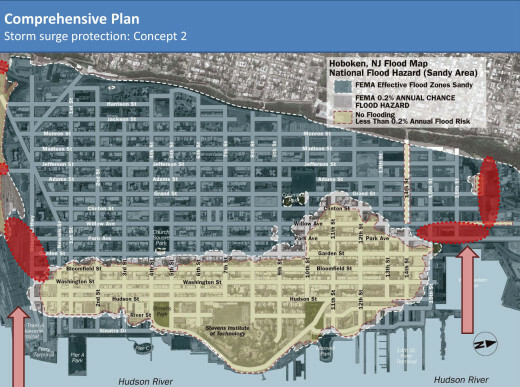 10 http://www.nj.com/jjournal-news/index.ssf/2014/06/innovative_plan_aims_to_preven.html The $230 million in federal funding won't pay for all of the city's plan as it is also intended to provide flood protection in Weehawken and northern Jersey City. Hoboken will receive $230 million from HUD for implementation of the "Resist, Delay, Store, Discharge" project, which the City hopes will spur additional public and private investment in the community. The grants for Hoboken are part of a $900 million commitment by HUD to fund the six winning proposals. 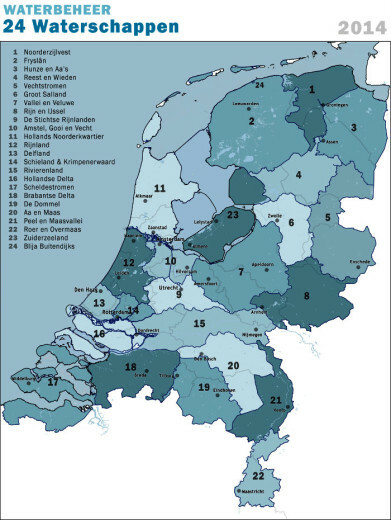 Map of water board districts in The Netherlands. Courtesy of Jan-Willem van Aalst. The Dutch may not be the sole source of expertise in dealing with water and community, but they may offer lessons for us in governance. In his presentation at the New York Center for Architecture on April 22 this year, Henk Ovink referred to almost 800 years of Dutch technical and governance experience that can serve as a touchstone for sustainable efforts moving forward. Recognizing that one man’s solution may be creating another man’s problem, the Dutch have developed a system of “water boards” as a primary governance structure addressing flooding and water. The water boards transcend and function independently of all other local and regional jurisdictions. The patience and long-term perspective in recovering and sustaining land from the North Sea can serve as a model as we grapple with the enormous costs and technical challenges of sea level rise and climate change.